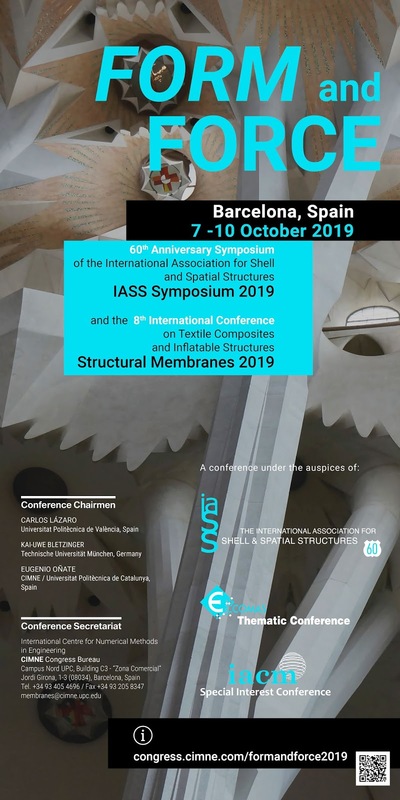 Internationally recognized and celebrated artists, designers, engineers, and researchers in cooperation with top universities from all over the world are invited to participate in a contest and exhibition of innovative lightweight structures. The structures must display a strong vision of structural design and innovation and demonstrably be the result of structural engineering focused research projects. The exhibition aims to show new insights into structural typologies, through the design of a pavilion. The pavilions will be exhibited in the summer of 2019 and during the joint IASS - Structural Membranes Form and Force 2019 symposium in Barcelona. During the conference the contest jury, chaired by the president of the IASS, will award a prize to the most innovative realized structure. The competition brief is to design an innovative lightweight pavilion, of maximum external dimensions 4x4x4m. It must be transportable and fit into six boxes each with a maximum external size of 1x0.75x0.65m and maximum weight of 32kg (total pavilion 192kg). The structure should reflect the structural engineering research of the submitting team. Each structure will be judged by examining the production techniques, materiality, level of structural innovation, constructability, transportability, architectural expression, and overall originality of the finished pavilion. The choices of materials, manufacturing methods, erection techniques, and so forth are at the entire discretion of each team. Innovative ideas and prototype methodologies that push the boundaries of construction are strongly encouraged. Submission extended to January 20, 2019!